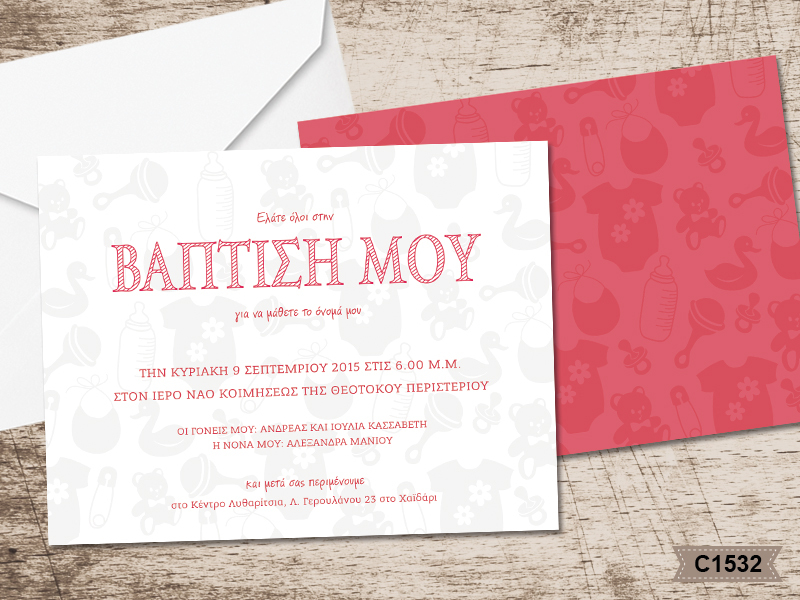 Cute Greek Baptism invitations for boys and girls. This adorable invitation is coming with beautiful children's items pattern paper, in pink or light blue colour. The matching envelopes are classic white paper and your personalized wording is printed in pink or blue colour upon request. https://www.preciousandpretty.com/2017/05/christening-invitations-with-cute-childrens-items-C1532.html Greek Wedding Favors|Orthodox Crowns|Stefana|Baptism Invitations Christening invitations with cute children's items C1532 Greek Christening invitations with children's items for boys or girls Product #: Greek Wedding Favors|Orthodox Crowns|Stefana|Baptism Invitations_2048132449515677762 5 stars out of 5 reviews.